Angelina (Russo) DeCaro, age 93 of Stratford, beloved wife of the late Joseph James DeCaro entered eternal rest Sunday January 13, 2019 at Bridgeport Hospital. 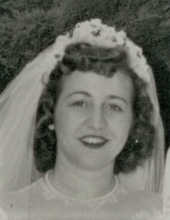 Angelina was born in Greenwich April 10, 1925, daughter of the late Charles and Domenica (Fortugno) Russo and resided in Stratford the past 60 years. Angelina was a graduate of Greenwich High School and a member of the National Honor Society, a retired executive secretary for AMF, Greenwich and enjoyed spending time with her family and grandchildren. She is survived by a son, Joseph Carl DeCaro of Stratford; a daughter, Mary Sliwinski and her husband, Paul of Guilford; two grandchildren, Michelle Sliwinski of Washington D.C. and Paul Sliwinski of Boston MA. and many nieces and nephews. She was predeceased by two sisters, Josephine Romano and Frances Sottosanti. Friends are invited to attend a Funeral Mass of Christian Burial on Thursday, January 17, 2018 at 12:30 p.m. by meeting directly at Holy Name of Jesus Church, 1950 Barnum Ave, Stratford. Interment will follow in St. Michael Cemetery, Stratford. To send flowers or a remembrance gift to the family of Angelina (Russo) DeCaro, please visit our Tribute Store. "Email Address" would like to share the life celebration of Angelina (Russo) DeCaro. Click on the "link" to go to share a favorite memory or leave a condolence message for the family.